The wait is now over! 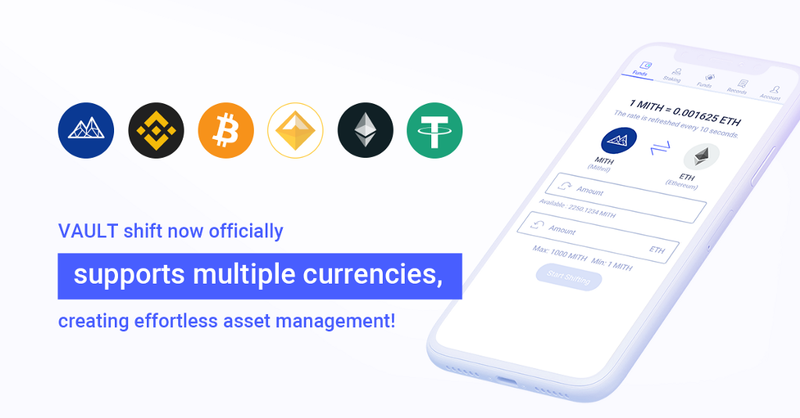 Mithril is thrilled to announce that in addition to ETH and MITH, VAULT now officially supports shift feature for BTC, USDT, DAI and BNB! VAULT now supports close to 10 cryptocurrencies. This update also includes the most-anticipated “shift” feature. This allows a one-click exchange between all supported currencies with instant exchange rates available. VAULT will continue to support more stable and mainstream currencies that grants an efficient and simple digital wallet experience. In addition, Mithril will release VAULT APP later this year. Users will then be able to manage their digital assets effortlessly with a convenient application of MITH or other cryptocurrencies in everyday life. For more updates, stay tuned to all official channels of Mithril!